Anyway, one of the nice things about having a metal back is that it can be engraved with different things if you so wish. There are obviously countless third parties who can do that for you, but over in Russia Samsung itself is offering just such a service for the aforementioned members of its A line. The process is very simple, as there’s a special website created for this purpose. You choose one of the phones, its color, and then select a picture (and/or text) and create a unique engraving from it. This will then be applied to the actual handset that will be shipped to you. Unfortunately for now it doesn’t look like you can use your own images – rather, you have to pick from a (pretty limited) list that’s been prepared by the phone maker. If you want some text engraved, you can pick a specific font, but again from a not so big selection. Perhaps if this program is successful the Korean company will think about expanding the number of fonts that are available, along with letting people add custom images. This appears to be a limited time run, so if you’re in Russia and want to order such an engraved Galaxy A3, A5, or A7 smartphone, you should do that before April 30, as that seems to be the end date for the promotion. 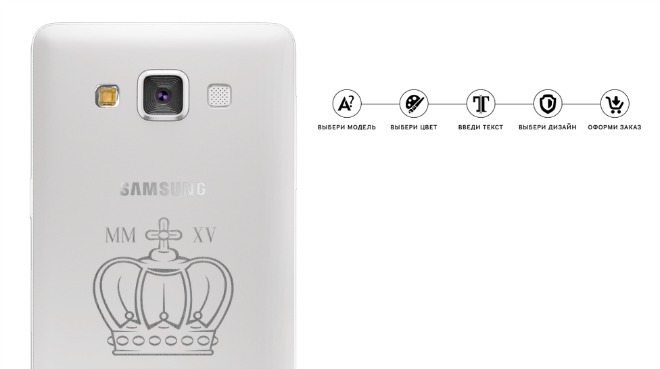 It’s unclear if Samsung will ever take this idea to other markets.